SNAME Spring Meeting and STAR Symposium W a s h i n g t o n , D.C. — A p r i l 6-8 The maritime world, indeed the world at large, is changing rapidly. 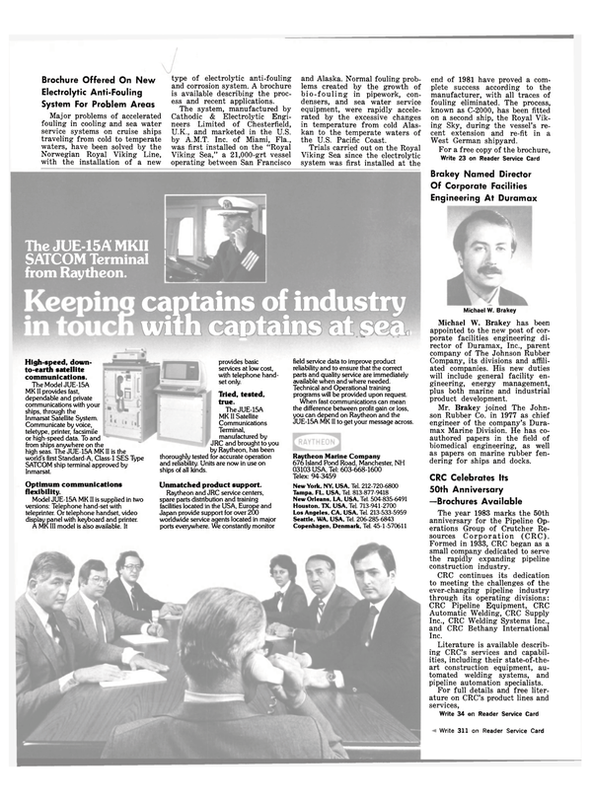 What has happened and is going to happen will be the focus of The Society of Naval Architects and Marine Engineers' Spring Meeting/STAR Symposium in Washington, D.C., April 6-8, 1983. The theme, "Maritime T e c h n o l o g y f o r a Changing World," or the locale could not be more appropriate, in the light of all the changes and new policies that are taking place in government, which so affect the maritime and related industries. To be held at the L'Enfant Plaza Hotel, the meeting will feature addresses by key maritime leaders, sessions of technical papers, panel discussions and other elements that will make up an outstanding program. This will be the eighth STAR Symposium, a series begun some years ago by the Society, (STAR stands for Ship Technology And Research), and now combined with its Spring Meeting. All programming efforts are being directed by the Society's host Chesapeake Section, the Steering Committee under Walter Schmid, and the Technical Program Committee led by Marvin Pitkin. Outstanding speakers have been assembled for the first day of the meeting, April 6. These include at least 10 dignitaries from the private, public and military sectors who will speak on "The Changing World." A panel discussion of all these speakers will conclude the first day. There will be many opportunities for registrants to participate in the discussions. The second and third days, April 7 and 8, will feature concurrent technical sessions, with a variety of papers on "Man/' Machine Technology" and "New Directions." These presentations will include papers on computeraided design, energy, human factors and simulation. The technical portions of the meeting will conclude with two panel discussions, one moderated by Phillip Eisenberg, on "New Directions for Offshore Development," and the other by Wolfgang Reuter, on "Education to Support Ship Design and Construction." An entertaining social program will be provided which will include the President's Reception, the President's Luncheon, and tours to the Kennedy Center and Mount Vernon. Technical Sessions Session I—Wednesday, April 6. Theme — "The Changing World" Welcoming Address: Walter E.
Schmid, chairman of 1983 Spring Meeting/STAR Symposium. Moderators: Morning session, "Commercial Requirements of the Eighties," Marvin Pitkin, Technical Program Chairman. Afternoon session, "National Requirements of the Eighties," Vice Adm. Earl B. Fowler, USN, Commander Naval Sea Systems Command. Paper No. 1-1 — "Future Requirements of the Offshore Marine Industry" by Carl H. Savit, senior vice president technology, Western Geophysical Company. Paper No. 1-2 — "Future Requirements of the U.S. Domestic Marine Industry" by Anthony L.
Kucera, president, American Waterways Operators, Inc.
Paper No. 1-3 — "Future Requirements of the U.S. Port Industry" by J. Ron Brinson, president, American Association of Port Authorities. Paper No. 1-4 — "Future Requirements of Liner Vessels" by W. James Amoss, president, Lykes Bros. Steamship Company. Paper No. 1-5 — "Future Requirements of Tank Vessels" by Frank J. Iarossi, president, Exxon Ship Company. Paper No. 1-6 — "Future Requirements of Bulk Vessels" by Charles Kiskaddon Jr., president, Alcoa Steamship Company. Paper No. 1-7 — "Future Requirements of the Maritime Industries" by Hon. Harold E.
Shear, Adm. USN (ret. ), Maritime Administrator. Paper No. 1-8 — "Future Requirements of Coast Guard Vessels" by Adm. James S. Gracey, Commandant, U.S. Coast Guard. Paper No. 1-9 — "Future Requirements of Naval Vessels" by Hon. George A. Sawyer, assistant Secretary of the Navy, Shipbuilding and Logistics. Theme — "Man/Machine Technology" Moderators—Ronald M. Reese, Session II-A, and Stuart W.
Paper No. II-A-1—"Recent Advances in Computer Graphics in the Shipyard Industry" by J.
SYNOPSIS: Computer-aided manufacturing (CAM) in shipbuilding started with the introduction of N/C flame-cutting equipment around 1960. Links between design, manufacturing and a d m i n i s t r a t i v e computer functions are still few. Turnkey drafting systems now in use complement the CAM systems to some extent but faired lines from a CAM system cannot be transferred into a drafting system. Also, the detail design drawings generated by a drafting system cannot be used for automatic parts generation. This paper discusses the computer software used by the shipbuilding industry and areas in which work needs to be done to improve computer usage. Paper No. II-B-1—"Recent Advances in Computer-Based Shipboard Maintenance and Operations Management Systems" by N. Bassett and J. Rodgers. SYNOPSIS: This paper describes the development and installation of a shipboard computer system aboard a Great Lakes freighter, which performs maintenance and inventory control functions as well as crew payroll. System design criteria, program operation, and system implementation are discussed in addition to comments on crew acceptance. Paper No. II-A-2—"Recent Advances in Ship Producibility Research" by J. DeMartini. SYNOPSIS: Significant achievements produced by the two elements of the Ship Producibility Program, (1) the National Shipbuilding Standards Program (NSRP), and (2) the Shipbuilding Industrial Engineering Program are highlighted. As part of the National Shipbuilding Research Program, these two programs, organized under the SNAME Ship Production Committee, continue to contribute to the NSRP's goal of reduced shipbuilding costs and construction time and help to provide a sound foundation for the future of U.S.
Paper No. II-B-2—"Recent Advances in Planning and Scheduling of Ocean-Borne Transportation" by B. Douglas and K. Stott Jr.
SYNOPSIS: The development and operation of a model-based decision- supported system for oceanborne transportation are described. For the past several years, this interactive time-sharing system has provided two sets of functions in that: (1) it guides marine operations management in both annual planning and spot decisions; and (2) it assists operating personnel not only in conducting routine scheduling on a w e e k - t o - w e e k , month-to-month basis throughout the year but also in making rapid adjustments for emerging opportunities and requirements. Paper No. II-A-3 — "An Effective Approach to Structural Design for Production" by C. Kuo, K. MacCullum and R. Shenoi. SYNOPSIS: The research outlined is concerned with the important question of design for production of ship structures. The main emphasis is placed on achieving effective interaction between design and production via the use of an appraisal procedure that incorporates producibility of design while quantifying the various production factors. A method of formulating an effective appraisal approach is outlined together with a production costing methodology. Paper No. II-B-3 — "A New Approach in Automation and Electronics Maintenance f o r High T e c h n o l o g y Vessels" by R.
SYNOPSIS: The rapid evolution of electronic and electro-mechanical control systems and communication equipment aboard modern cargo ships is causing a significant change in the way that operational maintenance is conducted aboard ship. The trend seems to be to automate communications functions, and to relieve the radio officer for general electronics maintenance duties, which in turn requires a more skilled, technically trained individual. This paper recounts the author's experience in recruiting and training electronics officers; his experience implementing an electronics officer program with the El Paso Marine Company, and some suggestions regarding future crewing, training and management to take full advantage of new information technologies and robotics in future ships. Paper No. II-A-4 — "Recent Advances in Energy Savings Achieved in Icebreaker Operations" by LCDR D. Egan, USCG. SYNOPSIS: The apparent energy savings achieved with a new hull paint system on the CGC Northwind are discussed. CGS Northwind's primary mission requires long voyages to operating areas in the polar regions near Greenland and Antarctica. Because sustained operations are required from the nearest sources of support, fuel conservation is vitally important and directly relates to the ship's endurance to complete its mission and safely return home. Paper No. II-B-4 — "National Defense Relevance of General Dry Cargo Carriers" by A. Baki and J. Tandon. SYNOPSIS: There exists a rather evident hierarchy of missions for the U.S. merchant marine in time of war or national emergency. They are (1) military auxiliary, (2) defense resupply (3) security of economy, and (4) commerce. In times of peace, the reverse hierarchy applies to commercial ship operators. There is evidence that in the past this reversal of objectives did not create any significant divergence of requirements affecting vessel design. A number of changes have occurred in recent years which have resulted in a mismatch of design requirements for peacetime commercial and wartime national interests. This paper discusses these changes and recommends a methodology by which ships from the contract dry-cargo fleet can be selected for wartime use. Paper No. II-A-5 — "Human Factors in Naval Ship Design" by J. Castle, R. Feaga and A.
SYNOPSIS: Reports by the General Accounting Office, the Naval Research Advisory Committee and Fleet Commanders have identified serious U.S. Navy Mil- itary Personnel problems which are affecting fleet readiness and operating costs. These problems and effects could worsen as the pool of skilled personnel available to the Navy decreases and as it expands to a 600-ship fleet. A primary cause of these problems is inadequate considerations of human factors in ship design. This paper discusses Navy personnel problems, design-related causes and what is being done to better address human factors in naval ship design. Paper No. II-B-5—"Recent Advances in Underwater Surveys for Extension of Time Between Drydockings" by F. Metanzo and J. Metcalf Jr.
SYNOPSIS: Ships under the jurisdiction of the U.S. Coast Guard are required to have a drydock inspection every two years. Offshore oil rigs and bulk carriers have become so large that a biennial drydocking is a problem. This paper presents a survey of underwater technology as it applies to underwater inspection, maintenance and repair. It concludes that the capability exists to perform and encourages the Coast Guard to accept underwater inspection in lieu of drydock inspection on selected ships. Paper No. II-A-6—"Recent Advances in Simulation — CAORF's Contribution to Maritime Industry Productivity — 1982" by A.
SYNOPSIS: As a part of the Maritime Administration's efforts to improve the safety and productivity of the U.S. maritime industry, the Computer Aided Operations Research Facility (CAORF) was designed to provide costeffective solutions to problems i n v o l v i n g vessel operation. CAORF has pursued a research program involving five areas of significant concern: (1) harbor and waterway analysis, (2) training and certification, (3) groundings and collision avoidance, (4) ship control and maneuverability, and (5) bridge system design. This paper summarizes three CAORF projects and techniques in the application of real time man-in-the-loop simulation in the solution of vessel operation problems of the maritime industry. Paper No. II-B-6 — "Floating Industrial Plants — Business Going to Sea" by W. Fink. SYNOPSIS: In an attempt to identify new construction opportunities for U.S. shipyards, the Research and Development organization of the Maritime Administration has recently completed work in industrial plant vessels, also referred to as floating factories, floating industrial plants, plant ships or factory ships. The market seems to be expanding steadily and new opportunities are occurring on a continuing basis. This paper reviews the MarAd program activities and recent events which may assist implementation of these concepts into the U.S. shipbuilding market. Session I I I — Friday, April 8. Theme — "New Directions" Moderators—Wolfgang Reuter, Session III-A, and Phillip Eisenberg, Session III-B. Paper No. III-A-1 — "New Directions for Navy Manufacturing and Shipbuilding Technology" by R. Ramsay. SYNOPSIS: This paper provides a partial overview of naval and merchant shipbuilding industry problems. The planning approach for the Navy Manufacturing and Shipbuilding Technology (MT/ ST) Program, which will support the expanded naval construction program, is outlined in concept. The relative importance of production technology, management strategy and business structure is discussed in context with approaches to resolution of current problems facing the U.S. shipbuilding industry. Paper No. III-B-1—"New R&D Direction for the U.S. Merchant Marine" by J. Gross. SYNOPSIS: The subject of new R&D directions for the merchant marine, poses several questions: (1) what is the future of the U.S.
merchant marine, (2) what are its opportunities, (3) are the major problems that face the U.S.
m e r c h a n t marine solvable, (4) what is the role of research and development and innovation in the future merchant marine, and (5) what then should be the R&D directions for the U.S. maritime industry? In this paper, the author examines each of these questions and sets forth recommended R&D directions for improvement of the U.S. commercial maritime industry. Paper No. III-A-2 — "New Directions for Advanced Naval Ship Design" by N. Kobitz. SYNOPSIS: The need to develop a coherent method for incorporating into naval ship design the impact of changing roles and missions, threats and technology has long been a challenge to the design community. Over the past several years a method has been developed which addresses these needs. By combining several existing operations and adding some original concepts, a systematic approach to naval ship design and research requirement definition has been developed. It combines the mission work of the Office of the Chief of Naval Operations with the technology of the Naval Material Command to produce a continuous panel of ship alternatives from which the CNO can choose in formulating his shipbuilding program. Paper No. III-B-2 — "The U.S.
Coast Guard Advanced Marine Vehicle R&D Program: An Overview" by J. Milton and LCDR J. Tozzi, USCG. SYNOPSIS: Since its inception, the U.S. Coast Guard Advanced Marine Vehicle (AMV) R&D program has been directed at the application of AMVs to the Coast Guard's operational missions. The primary objective of the AMV R&D program has been to quantify the cost-benefit trade-offs of using AMVs to perform Coast Guard operational missions. The approach has been to conduct operations analyses in conjunction with literature reviews and operational and technical evaluations of specific vehicles. At present, some of the operations' research tools which have been developed are being applied to support the upcoming replacement of seventy-six 95-foot and 82-foot patrol boats. In the future, these tools may be refined and updated to support other vessel acquisitions. Panel Discussion — "New Directions for Education to Support Ship Design and Construction." Moderator—Wolfgang Reuter, executive vice president, Designer and Planners, Inc.
Panel Members: Vice Adm. C.R. Bryan, USN (ret. ), president, Webb Institute of Naval Architecture: "Naval Architecture Academic Community." Howard M. Bunch, associate professor of naval architecture, University of Michigan: "Ship Production Management and Technology." William M. Ellsworth, head, Systems Development Department, David W. Taylor Naval Ship Research and Development Center: "Ship Design and Technology R&D Management." John R. Lindgren Jr., vice president of engineering, Ingalls Shipbuilding Division: "Shipyard Engineering Management." Koichi Masubuchi, professor of ocean engineering and material science, Massachusetts Institute of Technology: "Welding and Ship P r o d u c t i o n Engineering Technology." Ellsworth L. Peterson, president, Peterson Builders, Inc.: "Shipyard Management." Student: to be selected. Panel Discussion — "New Directions for Offshore Development." Moderator: Phillip Eisenberg, past president, SNAME. Panel Members: John E. Halkyard, president, John E. Halkyard and Co.: "Ocean Mining." James A. Rickard, planning manager, Exxon Production Research Co.: "Oil and Gas Extraction Research Co." D. Lee Alverson, Natural Resources Consultant: "Living Resources Consultant." Robert H. Douglas, project manager, Tactical Systems, TRW, Inc.: "Ocean Energy." John E. Flipse, professor of ocean engineering, Texas A&M University: "Effects of Law of the Sea Treaty." Social Activities Early Bird Reception — For those early arrivals who wish to meet old friends and make new ones, a reception will be held on Tuesday, April 5, in the Lafayette Room. Orientation Breakfast, April 6: Welcoming breakfast with brief program orientation and description of the social programs and tours. Authors / Moderators Breakfast, each day: Authors and moderators for the day's technical sessions will have a chance to meet each other and review the meeting schedules. President's Reception, April 6: Participants will travel by motorcoach to the Navy Memorial Museum at the Washington Navy Yard where Society President C.L. French will receive all registrants. President's Luncheon, April 7: This luncheon will feature the presentation of several important awards and an address by Society President C.L. French. Evening at the Kennedy Center, April 7: This event will start with transportation by motorcoach to the John F. Kennedy Center for the Performing Arts. Attendees will walk through the Hall of Nations, view the Kennedy bust, and proceed to a reception and private buffet supper in the Atrium Lounge. After supper, they will go to the Opera House for a performance of "Dance a Little Closer." Potomac Cruise, April 8: This closing event includes a private Potomac River cruise to Mount Vernon aboard the M/V Diplomat. Music will be provided, as will a box luncheon. At Mount Vernon a tour of George Washington's home and the gardens will be held. The return trip will feature more music and dancing plus a dessert buffet. Special Tours: A tour will be provided for spouses and guests on April 6 to the Diplomatic Reception Rooms of the Department of State and the U.S. Capitol Building; lunch will be served at the Marbury House in Georgetown, followed by a visit to Dumbarton Oaks. On April 7 a special tour is provided to Alexandria, Va. This tour will be preceded by a tour of the White House for those who desire to see the Presidential Home.